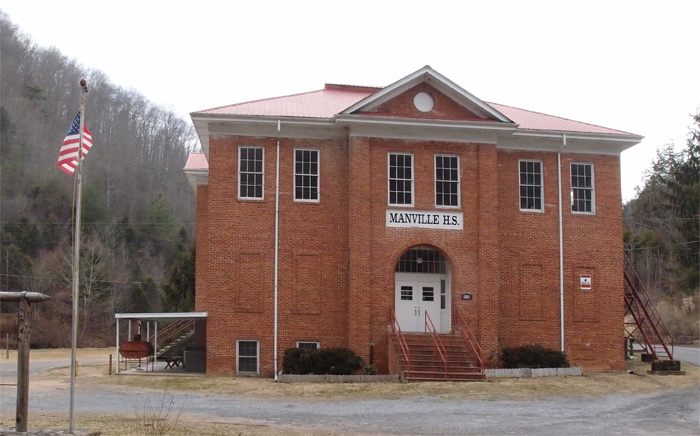 This is now Manville Community Center, but it started out as a wooden structure sometime in the late 1800s. That building burned in the early 1920s and this solid brick school was completed in 1927. It remained a high school until 1972 and, by 1974, was a school for handicapped children. The school closed permanently in 1981. This is located on Manville Road (Hwy 665) at the intersection of Hwy 664 north of Gate City almost right on the Scott County line. Metric GPS is 36.67048, -82.64246. I thank Rita at the Scott County Library in Gate City for all this information. There was nothing I could find on the web about this school.